Here is the Japanese Haiku which I just made ..
“Looking up at the Autumn sky and then think about Madamamura. The Autumn is coming and the leaves are falling down. Autumn is a beautiful season which we strongly feel Japanese four season. Japanese four season enriches your mind and soul. 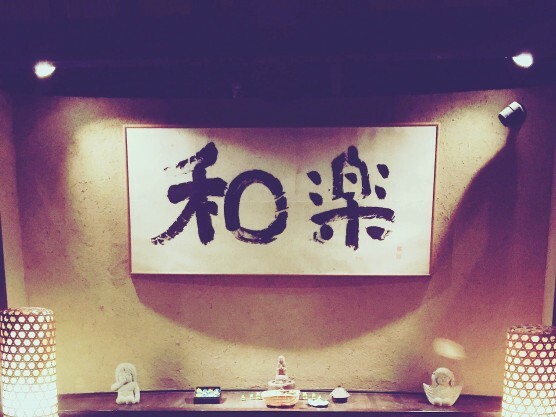 You can see this calligraphy 「和楽」is hanging at the wall at Madamamura. This calligraphy was wrote by Shinmin Sakamura he is national Japanese poet who passed away more than 10 years ago. He stayed overnight and drew this calligraphy in the middle of night at Madamamura. He told us that he can receive inspiration in the middle of night. He puts lots of emotions and heart into this two words. You will feel calm and bliss. Please feel the power of this words.